Here you'll find information about connect computer to stereo, or the other way around. Most stereo equipment have cinch or RCA jacks. Most sound cards have mini-stereo jacks. Sound cards nowadays have digital connections (S/PDIF). If you have hifi equipment, you can connect it to the computer and decide if want to record a vinyl lp or a cassette on to the computer. In this case leave the turntable and the cassette player connected to your stereo equipment and use the output (monitor/cassette rec-out/video rec-out) to lead the signal to the pc. The advantage of this is that you simply can switch between recording from turntable and cassette player. If you do not have a receiver or amplifier, you need to purchase a stereo phono preamplifier for your turntable. The cassette deck can be connected straight to the sound card. Connect the rec-out of the cassette player to the line-in of the sound card using a Y audio cable (3.5mm mini-phone stereo to 2x RCA male) see picture below. You can also use the Y audio cable to connect the stereo equipment to the sound card, and is available in different lengths. Sometimes this cable is delivered with the sound card. To connect an amplifier/receiver to the pc, you need two Y audio cables in order to make optimal use of the amplifier/computer combination. Look at your pc as if it were a digital cassette deck that can record and playback. To connect the amplifier use the tape in- and output. 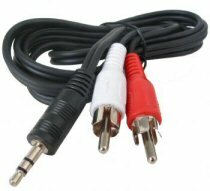 Insert the RCA plugs into the REC or (line) OUT of the amplifier, red cord into red (right) and white (sometimes black) into white (left). The 3.5mm stereo mini-phone into the ‘line in’ of the sound card. Insert the RCA plugs into the PB, PLAY or (line) IN of the amplifier, red cord into red (right) and white (sometimes black) into white (left). The 3.5mm stereo mini-phone into the ‘line out’ of the sound card. With ‘5.1’ or even ‘7.1’ sound cards use the ‘Front out’ (green) as ‘line out’. In this case the sound card is used as a stereo sound card. This setting can be changed with the software that comes with the card. 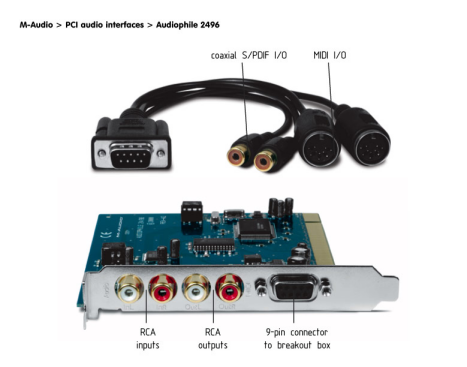 A sound card with S/PDIF (Sony/Philips Digital InterFace) can transmit the audio signal digitally from, in this case, the sound card to the amplifier. This can be done in two ways, coaxial by means of a (simple) RCA cable, or optical by means of a (fibre) optical cable with TOS Link plugs . If your sound card has an optical connection but your amplifier has a coaxial connection you could consider to buy a converter. An example of a suitable converter is CABLES TO GO 40019 Optical -coax Audio Converter . Is it the other way around, so the amplifier has an optical connection and the sound card has a coaxial connection you could, again consider to buy a converter. But this time it converts a coaxial signal to an optical signal. 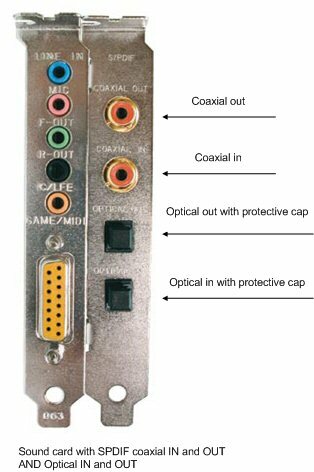 An example of a suitable converter is CABLES TO GO 40018 Coax- Optical Audio Converter . This sound card fits best for recording LP’s. Stereo in- and output, simply connect your RCA cords and your done connecting. No goings-on with left front or right back or splitters and adapters, just left and right. Sound card with RCA connections are rare. The card in the above picture is one of the few I found. It is a sound card of M-Audio Audiophile 2496 , available for a price around $100,-. A steep price but worth the money.